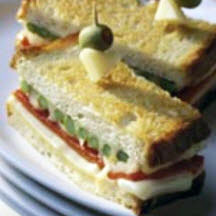 CooksRecipes has quality, kitchen-tested recipes for panini sandwiches, a deli that hails from Italy. The word panini is Italian for roll or biscuit, but it can also refer to a sandwich filled with any combination of meats, cheese and vegetables and pan-grilled while being compressed by a heavy weight (such as a foil covered brick). Recipe kindly provided by Chef/Owner John Strohm of Palm Springs Koffi in Palm Springs, California. 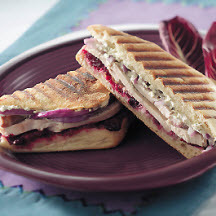 This "oh so good" recipe for Grilled Mozzarella Panini was created by Mr. Food`s Kitchen. 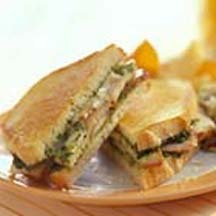 This recipe for grilled Italian panini feature thinly sliced grilled boneless pork chops topped with pesto and provolone cheese.